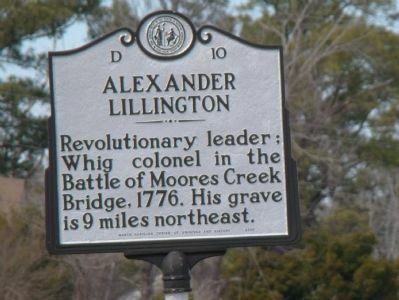 Revolutionary leader; Whig colonel in the Battle of Moores Creek Bridge, 1776. His grave is 9 miles northeast. Location. 34° 26.424′ N, 77° 52.782′ W. Marker is in Rocky Point, North Carolina, in Pender County. 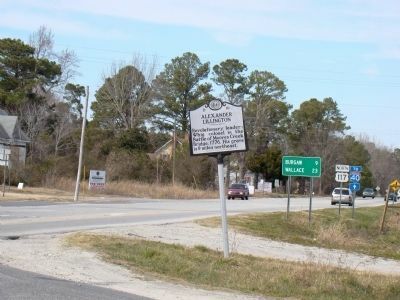 Marker is at the intersection of U.S. 117 and North Carolina Highway 210, on the right when traveling north on U.S. 117. Touch for map. Marker is in this post office area: Rocky Point NC 28457, United States of America. Touch for directions. Other nearby markers. At least 8 other markers are within 7 miles of this marker, measured as the crow flies. General John Ashe (approx. 0.7 miles away); Edward Moseley (approx. 2.4 miles away); Samuel Ashe (approx. 2.7 miles away); William S. Ashe (approx. 2.7 miles away); Prisoner Exchange (approx. 5.3 miles away); Early Drawbridge (approx. 5½ miles away); James Innes (approx. 6 miles away); George Burrington (approx. 6.8 miles away). Touch for a list and map of all markers in Rocky Point. More. Search the internet for Alexander Lillington. Credits. This page was last revised on June 16, 2016. This page originally submitted on March 28, 2010, by J. J. Prats of Powell, Ohio. This page has been viewed 825 times since then and 9 times this year. Photos: 1, 2. submitted on March 28, 2010, by J. J. Prats of Powell, Ohio. Editor’s want-list for this marker. Photos of the grave site • Can you help?